DogsBite.org recorded 39 fatal dog attacks in 2017. Pit bulls contributed to 74% (29) of these deaths, the highest death count on record for pit bulls and seven times more than the next closest breed. German shepherds followed, inflicting 4 deaths. 13 different dog breeds contributed to lethal attacks in 2017. The last time the CDC collected "breed" data about dogs involved in fatal human attacks was 1998. Since this time, pit bulls have mauled to death over 340 Americans. 39 U.S. dog bite-related fatalities occurred in 2017. Despite being regulated in Military Housing areas and over 900 U.S. cities, pit bulls contributed to 74% (29) of these deaths. Pit bulls make up about 6.5% of the total U.S. dog population. During the 13-year period of 2005 to 2017, canines killed 433 Americans. 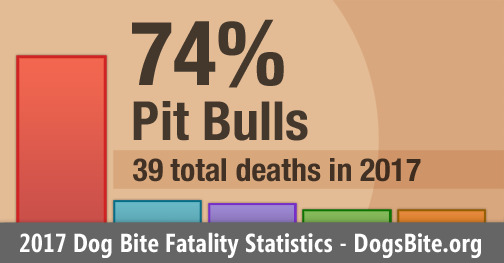 Two dog breeds, pit bulls (284) and rottweilers (45), contributed to 76% (329) of these deaths. 32 different dog breeds contributed to the remaining fatal dog maulings. In 2017, the combination of pit bulls (29), their close cousins, American bulldogs (1) and mastiff-type guard dogs and war dogs (2) contributed to 82% (32) of all dog bite-related fatalities. 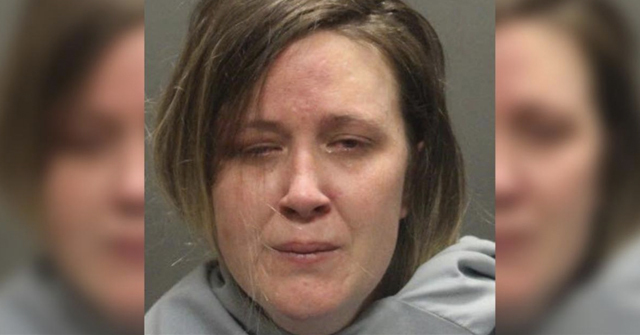 Rottweilers inflicted 1 death, killing an 18-month old Phoenix boy. This year's release includes statistics from our 13-year data set. From Jan. 1, 2005 to Dec. 31, 2017, canines killed 433 Americans. 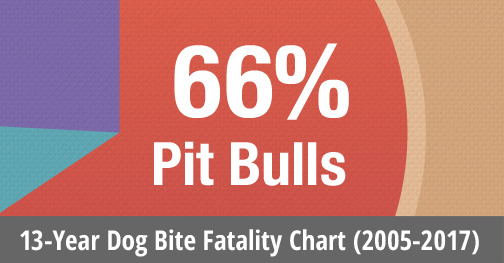 Pit bulls contributed to 66% (284) of these deaths. Combined, pit bulls (284) and rottweilers (45) contributed to 76% (329) of attacks resulting in death. When mastiff-type guard dogs and war dogs are added -- the types used to create "baiting" bull breeds and fighting breeds -- this small group of dog breeds accounts for 84% (363) of all dog bite-related deaths. In discussion notes, we examine 2017 trends, two changing metrics since the CDC study years (1979 to 1998) and the "Exponential Effect." DogsBite.org - 2017 saw a surge of dog bite fatalities at the end of the year with 8 fatal dog attacks, including the high profile case of a 22-year old woman, whose remains were discovered on December 14 after she was killed and eaten by her own two pit bulls. 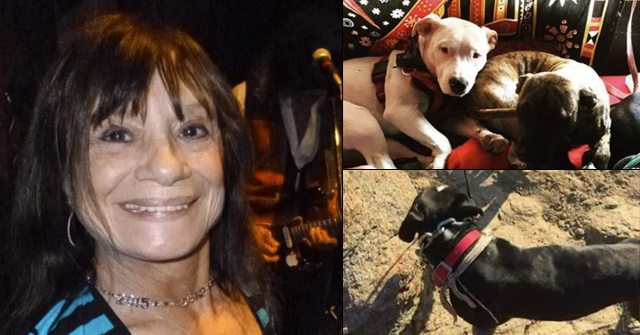 Other late-year cases include two women in Alabama who were killed by "packs" of pet pit bulls one week apart and a woman in Arizona who was fatally mauled by a rescue akita she was hoping to rehome. Due to two events in 2017, the public became more aware of the risk unregulated rescues and their "transport" operations pose, which routinely "pull" dogs with behavior problems from death row and truck them across state-lines to be rehomed. The grave facial mauling of a child in Iowa by a pit bull-mix shortly after adoption and a lethal attack in Virginia, carried out by a pit bull adopted seven hours earlier, set the stage for debate, civil lawsuits and new state legislation. Over the course of 2017, our nonprofit sent out 8 FOIAs to uncover more information about suspected fatal dog maulings. We uncovered 2 new deaths in 2017, one in Adams County, Illinois, the other in Palm Beach County, Florida. 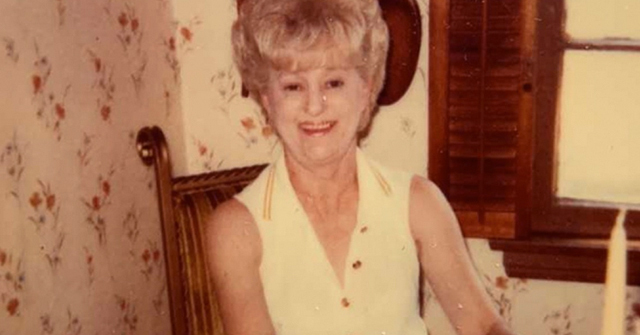 Two deaths by sepsis due to untreated severe dog bite injuries were also discovered, the 2013 death of a 61-year old Palm Beach County, Florida man and the 2016 death of Lisa Breckenridge in Bexar County, Texas. Both attacks involved pit bulls. Currently, death by sepsis cases due to untreated severe dog bite injuries are excluded from our data set, but we still retain the case information. In 2017, 10 dog attack-related deaths were also excluded. Two of those deaths involved aggressive non-bite injuries (struck by dog death).1 Qualifying struck by dog deaths may be added to our fatality data set at a future time, since the CDC already combines "bitten or struck by dog" deaths under the same ICD-10 mortality code. 2017 marks the highest annual death count for pit bulls (29) since we began tracking this data over 10 years ago. The last 5-year death rate average for pit bulls (2013 to 2017) is 26.4. In an earlier 5-year period (2005 to 2009), it was 17. 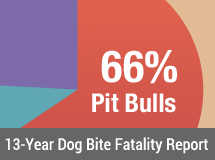 That is a 55% rise in the annual pit bull death rate between the two periods. In 2017, German shepherds inflicted the second highest death rate, 4, followed by mixed-breeds with 3 deaths, and 10 different breeds involved in 1 to 2 deaths. Rottweilers, the second most lethal breed since 2005, inflicted one death in 2017, a predatory attack on a child. 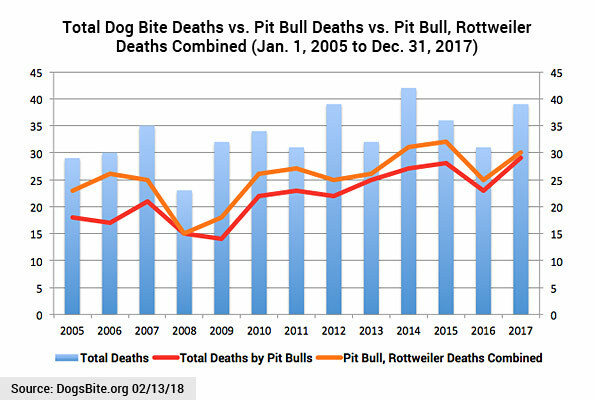 A chart breaking down the 13-year data set into two periods (6- and 7-years respectively), shows that deaths inflicted by rottweilers have decreased from 14% to 7% and deaths inflicted by pit bulls have increased from 58% to 71%. The charts indicate that soon only two categories may be relevant in fatal dog attack statistics: pit bulls vs. all other dog breeds. In 2017, the ratio of adult deaths (62%) to child deaths (38%) was the highest on record. Last year we examined changing metrics in fatal dog attacks since the CDC last examined this issue. The rise in adult deaths was one of them. During the early CDC study period (1979-1988), only 30% of all fatality victims were ages 10-years and older. This metric has been increasing ever since. From 2005 to 2017, 52% (225) of all dog bite fatality victims (433) were ages 10-years and older. Pit bulls inflicted 72% (163 of 225) of the attacks that killed a person 10-years and older vs. all other dog breeds combined, which killed 28% (62). What remains constant today, as in the CDC study years, is that infants ≤11 months have the highest age specific fatality rate. Over the 13-year period from 2005 to 2017, infants made up 48% (55 of 115) of all deaths in the 0-2 age group and 13% of all dog bite fatality victims. During the early CDC study period (1979-1988), infants ≤11 months comprised 16% of all deaths (25 of 157). Despite decades of safety advancements since, these preventable infant deaths continue. Another metric shift we examined last year was the falling rate of fatal attacks inflicted by a single dog. In 2017, 49% of all dog bite-related fatalities involved a single dog, down from the first CDC study, when 70% of all deaths involved one dog. In our 13-year data set, 53% (231) of all fatalities involved a single dog and 47% (202) involved multiple dogs. Attacks by pit bulls involving more than one dog (commonly another pit bull), contributed to 72% (146) of the multi-dog subset. In the last 13-years, 51% of all fatal pit bull attacks (146 of 284) involved more than one dog, vs. 38% (56 of 149) of attacks not involving pit bulls. Multi-pit bull households are a chief contributing factor to the rise of fatal attacks inflicted by multiple dogs. Of the 202 deaths involving more than one dog, 65% (131) were carried out by two or more pit bulls belonging to the same household. 50% (66) of these deaths involved 2 pit bulls; 33% (43) 3 to 4 pit bulls; 11% (14) 5 to 6 pit bulls and 6% (8) 7 to 17 pit bulls. In our 13-year data set, pit bulls also accounted for 72% (73 of 102) of all deaths that involved recent breeding activity. In 2005, when the City and County of Denver defended its pit bull ban, Dr. Peter L. Borchelt, PhD, an expert witness for the City, testified about the effect of increasing the number of pit bulls involved in an attack upon a human in terms of the likelihood of serious injuries or death. Rather than a simple multiplying effect (i.e., the mathematical pattern of x, x + x = 2x, 2x + x = 3x), Dr. Borchelt testified the effect would be closer to an exponential effect (i.e., 1 = x1, 2 = x2, 3 = x3). We examined this effect by reviewing fatal attack cases involving 3 or more dogs and the number of pit bulls that factored into each death. Of the 97 fatal attacks involving 3 or more dogs since 2005, 73% (71) included at least 1 pit bull attacking and 69% (67) included at least 2 pit bulls attacking. Only 4% (4) of the total 97 attacks involving 3 or more dogs included a single pit bull attacking (71-67=4). Of all fatal attacks (71 of 97) involving 3 or more dogs that included 1 pit bull, death resulted 16 times more frequently when 2 or more pit bulls were attacking than when the group of dogs only included 1 pit bull attacking. In 2017, family dogs inflicted 72% (28) of all dog bite fatalities, a sharp rise from the 12-year average of 52%. Family pit bulls inflicted 64% (18) of these deaths. 43% (12) of family dog-inflicted deaths involved multi-dog households and 36% (10) of all victims were children under 2-years old. 29% (8) of family dog-inflicted deaths involved a dog or person new to a household (0-2 month period) and 14% (4) involved a babysitter watching a child at the time of the deadly attack. Pit bulls were involved in 100% of fatal attacks that resulted in criminal charges in 2017, up from the breed's 12-year average of 73% (59 of 81). Three states responded with legislation after a fatal pit bull attack in 2017. Legislators in Alabama introduced "Emily's Law," named after Emily Colvin who was killed by her neighbor's five pit bulls. In Virginia, after a newly adopted pit bull killed a woman, legislators put forth a bill requiring releasing agencies to disclose the bite history of all animals to adopters. In Ohio, a renewed attempt is underway to pass the Klonda Richey Act after a pit bull killed a Dayton man in 2017. 13-years of fatal dog bite statistical data is sufficient to evaluate the "breed-specific" issue. Pit bulls dramatically dominate attacks causing death. With the addition of rottweilers, these two breeds accounted for 76% of all deaths. 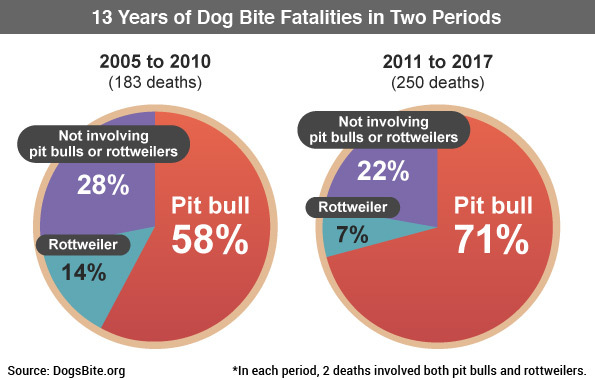 This year we removed the other breeds involved in fatal attacks from our 13-year fatality pie chart and renamed it, "not involving pit bulls or rottweilers." This shows how disproportionately the top killing breeds kill and how infrequently 35 other breeds do. Despite this glaring disproportionate fact, which the CDC first identified in 2000, powerful animal lobbying groups continue to push state-level preemption bills that prohibit local governments from adopting and enforcing breed-specific laws. Importantly, over the last three years (2015 to 2017), legislatures in 10 different states have rejected these preemption bills -- 90% failed to pass. Currently, six states face this type of legislation in 2018, including: Michigan and Missouri. Our call to action this year is to use our statistics and charts in correspondence with local and state officials. Use nonfatal severe injury statistics as well. Our 2016 special report summarizes key peer-reviewed medical studies (2009 to 2016). Since 2011, the majority of these studies report similar findings: pit bulls are producing a higher prevalence of injuries and a higher severity of injuries, requiring 3 to 5 times the rate of surgical intervention compared to all other dog breeds. 1Aggressive struck by dog deaths during 2017: Shirley Wright, 89-years old of Toledo, Ohio and Dr. William Deneke, 70-years old of Pine Bluff, Arkansas. 2Transcript: City and County of Denver, et al, v. The State of Colorado, et al, District Court of City and County of Denver, Colorado, Case No. 04CV3756, April 7, 2005. 3In one case, the couple had 5 dogs in their home already and had been under investigation by CPS prior to adopting a pit bull from the El Paso Animal Services Shelter. Five months later, this pit bull joined the other neglected family dogs in a fatal pack attack that brutally killed a child. That is the "no kill equation" at work. 4Updated April 10, 2018 to add two cases with criminal charges that were filed after the publication of this post on February 28. Both cases are from Alabama and involve the deaths of Emily Colvin and Tracy Cornelius. I might be able to understand multiple dog attacks on humans in a post-apocalyptic world, but not in a so called "First World" country in the 21st century. To me, the increase in pack attacks is one of the most frightening statistics of all. Thank you for all you do. It is quite sobering, and very sad, to see all the victims in a list. Every death listed here could have/should have been prevented. Are the numbers of fatal rottweiler attacks falling because rott owners are getting more responsible or because rotts are falling out of favour recently and there's less around? It's interesting that most of these pits carrying out the fatal attacks are not adopted from a rescue or prior home. Raising them from a puppy obviously doesn't make them safe (as some people claim). RE: Rottenwilers – it is interesting how the victim's age range spreads out across an "upside down" bell curve. Most of the victims appear to be small children and elderly. Seems as though rotts go after the proverbial low hanging fruit. RE: Animal Uncontrol — Yes, the rottweilers do. 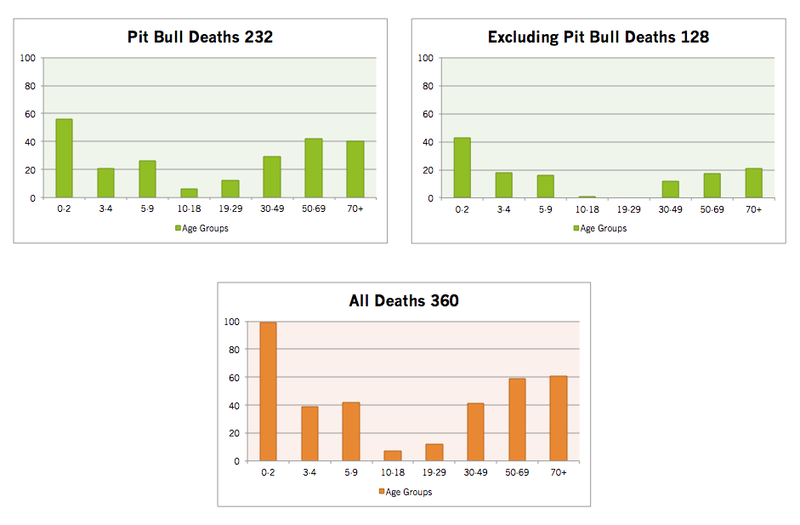 The curve is a more erratic inverted bell when looking only at pit bull deaths because they kill across all age groups. Here is an image (2005-2015) we made a few years ago when we looked at this closer. Since this time, pit bulls have killed at least 3 more people in their 20s, an age group virtually unheard of for fatal dog maulings. The top two age groups of pit bull victims are 0-2 (65 deaths, 23% of pit bull deaths and 57% of all fatalities in 13-year data set) followed by 50-69 (56 deaths, 20% of pit bull deaths and 74% of all fatalities in data set). I have two elderly friends who adopted a Rottweiler. I think they got it from our local humane society, or from our county's tax-supported shelter. It's a 90-something woman and her 70-something son. Son told me that the dog doesn't like anybody. Which is why I worry about him and his mother. It also motivated me to stay away from their house and to keep a safe distance whenever I see the son walking the dog.